Plot: The Grinch hatches a scheme to ruin Christmas when the residents of Whoville plan their annual holiday celebration. Starring: Benedict Cumberbatch. 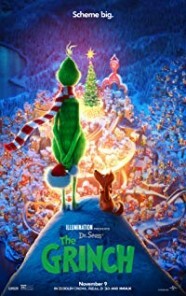 distributed by Universal «The Grinch» in the US movie theaters released on November 9, 2018 and has grossed over $96 million worldwide; dvd and blu-ray release date was set for February 5, 2019. Rent from Netflix and Redbox from February 5, 2019. «The Grinch» in the UK released in movie theaters on November 9, 2018. The movie released on dvd and blu-ray on March 11, 2019.